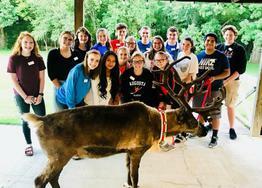 Youth Leadership Butler began in 1993 as a program of Leadership Butler, Inc. With this program being the first of its kind in the state, Youth Leadership Butler has paved the way for other youth leadership programs in the State of Kansas and across the nation. ​This program is funded by sponsorships from eight of the nine public school districts in Butler County, Kansas, a grant through the special liquor tax from the City of Augusta and the Leadership Butler Children's fund through the Central Kansas Community Foundation-Butler County. Volunteers from Leadership Butler, Alumni Association, staff and community members plan and facilitate the curriculum. Sessions are held on Monday evenings from September through October. Meetings continue as needed through the class project planning and execution. Leadership Butler believes not only adults need to exercise leadership, but the youth in the communities of Butler County also need to be aware of the opportunities they have to be a force in their communities and their schools. This program is offered to any high school junior attending a public school in Butler County. Youth who are home schooled are also encouraged to be a part of this program and can by contacting the Leadership Butler office.